How would you like to make the next Flappy Bird or Granny Smith? What’s that, you have absolutely zero developing games? You need not worry, my friend. 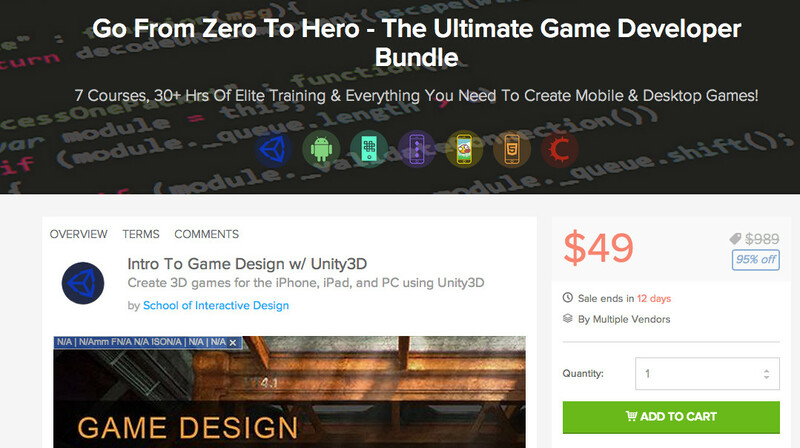 Through the DL Deals store, you can pick-up the Ultimate Game Developer Bundle for just $49, a 95% discount off the suggested price of $989. Seriously, that says 95% off. 95%. So what do you get and how will this bundle make you a game developing beast? There are 7 courses, 30+ hours of training, and over 100 lectures that should teach you all there is to know. The courses include topics like an intro to game design with Unity3D, creating your first game with Stency, HTML5 game development for beginners, creating puzzle games, learning Android app development from scratch, and of course, how to make the next simple flappy game. The deal and set of courses are only available for just over a week, so be sure to get in on it.